Teaching artist Kymberly Luke Mellen shares a few thoughts about her experience last summer participating in workshops for Performing Arts Educators at the Margolis Method Center. Theatre Professor, Denise Myers, shares her experiences participating in Performing Arts Educators Workshops at the Margolis Method Center. "I found Margolis Method to be remarkably focused, articulate, and specific for the training of actors. It continues to resonate in deep and meaningful ways. If you have the opportunity, I highly recommend this program." Work intensively with Kari Margolis and company members in a creative, supportive yet challenging environment specifically designed to maximize University teaching artists' personal and professional artistic experience. Workshops meet six hours per day Monday through Friday, with the studio remaining open for personal research and practice. Teaching artists can register for the Introductory Program as well as the two-week Certification Program. Each workshop day incorporates both experiential exploration and pedagogical analysis, giving you a personal experience as well as the specific tools needed to share this training with your students. Professor Certification participants will often return to the Introductory Workshop, which creates a stimulating artistic environment of shared experiences, knowledge, and insight. The Introductory and Certification Programs have become an exciting and rewarding way to start our summers here at the Margolis Method Center Int'l. We have established deep artistic connections with the educators who have joined us, and they, in turn, have built strong collegial ties with each other. 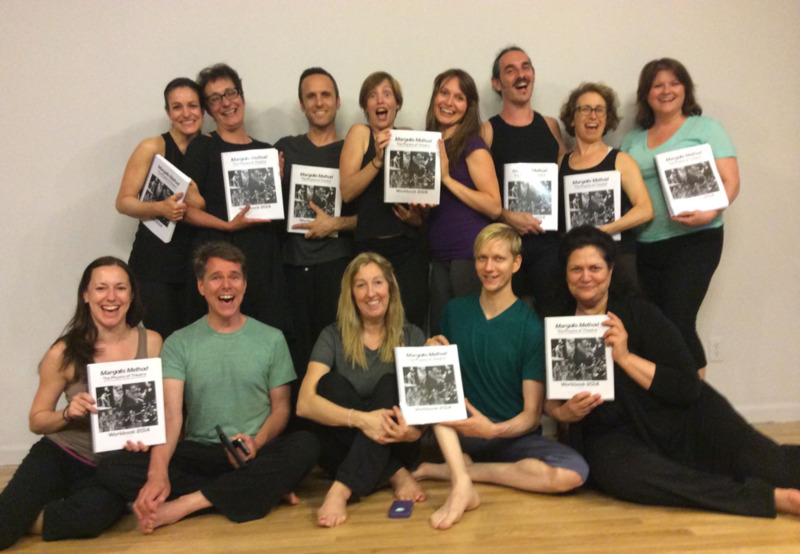 "Margolis Method is truly an approach to total actor training that can be seamlessly applied across genres/styles from text-based work, to devising and everything in between. My students are energized by this work and the fundamentals can be incorporated into your existing pedagogy!" There are three levels to Professor Certification, with each level offering a broader and deeper understanding of Margolis Method as well as increased professional opportunities. The certification process focuses on the pedagogical and philosophical breakdown of exercises and improvisational structures, making sure that each participant has the ability to both manifest and share concepts with their students. Certified teaching artists have the means to build the actor’s instrument, and create pathways for students to freshly interpret scripted text and be the source for the creation of new work. Margolis Method certification places an importance on the atmosphere in which we train our students, believing it has a direct affect on how and what they ultimately create. Achieving Level I requires the completion of the 30-Hour Introductory Workshop in addition to the 60-Hour two-week Certification Program. An official certificate will be awarded at the culmination of the 90 hours. Level I and II Certified Professors can teach in their school of employment integrating Margolis Method into their syllabus. Level III Professors can teach a full Margolis Method course and lead workshops at conventions and festivals such as KCACTF. Level III Professors can, if desired, enter the Professional Certification Program. To enroll in the Margolis Method Professor Introductory/Certification Programs, you must be a teaching artist employed by a University or High School, or have been in the past and are currently seeking employment. We will accept up to two Grad Students each summer who are focused on teaching. A letter of recommendation is required. The wealth and depth of knowledge past participating teaching artists have brought to the Introductory and Certification Programs has been profound, and has added a stimulating dimensionality to the discourse. 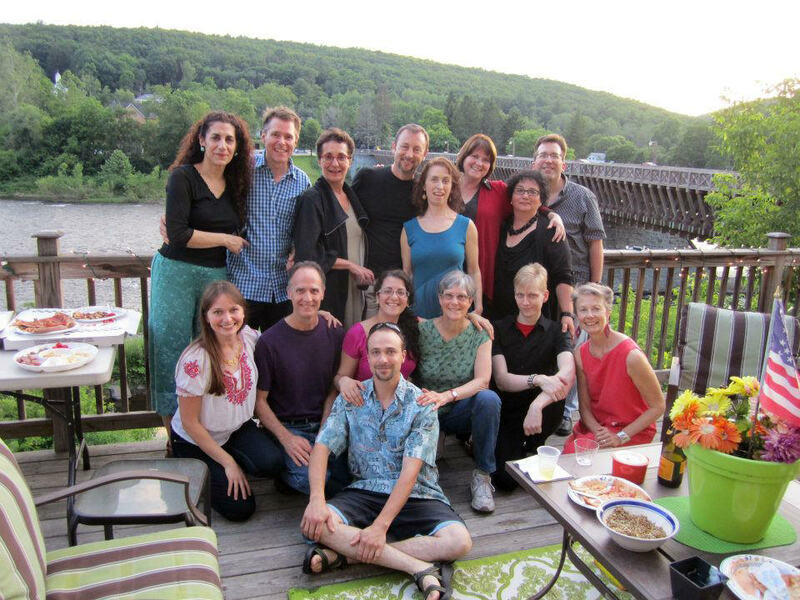 The overwhelming consensus has been that Margolis Method universally connects to all their previous experience, while offering a vivid theatrical vocabulary, clarity of craft, and fresh approach to invigorating the imaginations of their students. For participants of the Introductory Workshop, along with your certificate of completion you can professionally promote yourself as having completed the 30hr. Introductory Course. For participants of the Certification Program, along with receiving an official certificate, you may professionally promote yourself as a Level I Margolis Method Certified teaching artist. Leave feeling invigorated and equipped with an abundance of concrete theatrical exercises and strategies to empower your students to be strong, creative and articulate theatre artists. You will be able to take a fresh look at your classes based on the wealth of powerful learning tools the program provides and enhances your curriculum. Profit from the professional, collegial relationships you will build with like-minded teaching artists from around the country, and feel supported by a vibrant artistic community. *In support of educators being able to pursue more in-depth training, we offer discounted rates for longer stays. Teaching artists may choose to stay for as long as the entire Summer Session. If interested, please inquire. *Inquire about available partial scholarships for ATME members, KCACTF participants, and email subscribers. A non-refundable deposit of $350.00 is required for the Introductory Workshop or Professor Certification Program. A non-refundable deposit of $500 is required to register for both the Introductory Workshop and Certification Program. Balances are due on or before June 4th. Tuition includes workshop hours, use of studio before and/or after workshops, meet and greet and farewell gatherings, local transportation, PDF of 2019 Workbook, and a trial membership to the Online Learning Program. Participants interested in an annual membership to the Online Learning Program will also receive a special discount. Artist Housing is in beautiful accommodations on the Delaware River, within walking distance to the quaint Hamlet of Barryville, NY. Kitchens are fully equipped, there are ample common spaces, a washer and dryer, and bedrooms are shared with one other colleague. If there is space and you prefer a private room, this can be arranged for an extra fee of $175 for the Introductory Workshop and $450 if you are registering for all three weeks. Last summer, I was fortunate to have been able to take the Margolis Method Professor Certification Program with Kari Margolis and members of her Company. As someone who has experienced a number of different methods and trainings, I found Kari's Method to be remarkably focussed, articulate, and specific for the training of actors. It continues to resonate in deep and meaningful ways. If you have the opportunity, I highly recommend this program. Kari Margolis is an amazing teacher and theater-maker. Her work and Method is a major gift to the world of Devised theatre and physical training of Actors! I am indebted to her for her generosity and unique approach and enormous gift to Theater Making! Margolis Method has inspired me endlessly. It is truly an approach to total actor training that can be seamlessly applied across genres/styles from text-based work, to devising and everything in between. My students are energized by this work and the fundamentals can be incorporated into your existing pedagogy! Kari Margolis is a masterful teacher and amazing powerhouse. The Margolis Method has deepened my understanding of the art of theater and has empowered both my students and myself. The training is focused-articulate-& specific- the actor both novice and advanced have an infinite set of tangible skills to practice their craft. I spent the first two weeks of August at the Margolis Training Center in Barryville, NY training with Kari Margolis and her company. I went in hopes of finding inspiration for myself and new ways of inspiring an understanding of the physical instrument and its relationship to the actor’s process in my students. I am not sure what I expected to find. What I found was a pot of gold. The work Kari Margolis is doing with her company, and the actors and artists who come to train and research with her is of tremendous importance and has the potential to contribute significantly to the development of actor training in much the same way as the work of Jacques Copeau, Jerzy Grotowski, Tadashi Suzuki, Eugenio Barba and Jacques Lecoq. Kari has developed a vocabulary addressing the physical aspects of actor training in much the same way the work of Copeau, Grotowski and Lecoq changed the entire landscape of theatre training. The physical method she is working with allows for a direct connection to the actors process and is applicable to all aspects of acting and creating theatre. It is a method and vocabulary that directs the actor to a much deeper understanding of what is happening moment-to-moment, providing a clear way of scoring that creates a pathway to repeatable action. In addition to the acting methodology expressed in the Margolis Method there is a full body training that accompanies it. This physical training is designed to create a body that is a vessel of sensation; one that provides a kinesthetic understanding of the acting process. This entire training regime exists in a pedagogical environment designed to provoke questioning, creativity and the need to come to a profound understanding of the moment the performer is engaged in creating. I encourage you to go spend 2 weeks next summer training and learning with Kari and her company, and I highly recommend that you challenge your students to take the opportunity to learn from a master teacher and artist. Visit the website http://www.margolismethod.org to learn more. Kari and her company also do residencies at universities across the country; her work with college students has been seen at the Kennedy Center as part of the Kennedy Center American College Theatre Festival, and countless testimonials from her students prove that an investment in this opportunity will offer life-changing benefits to your undergraduates. This summer, after the workshop, I invited some of my students to work with the exercises so that I could get a sense of what I was able to communicate. I learned a lot about what I understood intellectually vs somatically. It also fueled my imagination when I saw how excited they were when experimenting with the Margolis Method. "I Weigh" is so freeing for my students. Moving their energy through their pipelines is empowering! Creating Packets...challenging! This semester I am teaching in two different actor training programs. At Brooklyn College and at the new conservatory of the Tom Todoroff Studio. In both classes I have been using the inside/outside exercises as contexts for bridging the Alexander Technique into the acting process through the body, breath and energy. I'm going very very slowly. They love it. It’s practical, cogent, well thought out, organized and creative. It’s scope is broad; capable of inspiring the novice and taking them to professional standards by addressing the balance of intellectual, physical and emotional creativity. It is based on what as human animals we already intuitively understand on a cellular level: physics - the objective, universal language of action/reaction. Because the laws of physics are universal it makes decision making and choice simpler - dramatic timing is innate. Not easier maybe but consistent and therefore truthful, practical and concrete. It integrates the acting and creative skill sets right from the get go by immediately applying the technical training to creative exploration and devising. Going from lab research directly to scripting is challenging and empowering because the student is required to make choices and live the consequences during the technical skill building period, not after the skills have been mastered. Kari talks about creativity and how physics fosters and enables the practice of being in the creative state. This pragmatic approach to the too often romanticized mystery of creation is refreshing and encouraging. It implicitly engenders respect, support, confidence and self empowered learning by addressing learning principles; not personalities or ‘talent’, nor does it hide behind that ubiquitous , mysterious or ambivalent theatre jargon. Inherent in the method is the belief that creativity and the ability to learn and improve is achievable by everyone. It espouses acting as skill and a vocation that does not rely luck or ’being discovered’ . This philosophy is backed up with tangible exercises that identify specific skills that can be learned and practiced therefore empowering all students to improve through practice on their own. Naturally the speed and degree of improvement varies. The point is that its not magic that determines success but rather hard work and rigor. Margolis Method considers the audiences’ experience as paramount to the craft and art of acting. ‘Honestly reigns‘ and ‘Actors need stuff to do‘ are 2 of the Method’s mantras. The Method shows the actor what to do to get better at manifesting what is going on inside the character. This means the audience sees and more importantly feels the truth of the moment to moment choices the actor is making on behalf of the character’s circumstance because they are being revealed before their very eyes. Therefore the actor and the audience are in confluence - both having real stakes in creating art. ‘Trust your intuition, the skill is to manifest it’ is another mantra of the Method. This means that in order for the individual to express at their highest level it is vital that they ensure that the needs of the ensemble are met - i.e. : the actors need to support their partners’ actions by transparently fulfilling set up expectations. And finally, but no less importantly these tools enable the student and teacher to self and peer analyze in a practical, objective, non threatening, constructive and loving environment. These skills provide a common language that fosters a camaraderie based on a shared vision - the premise that as each individual strives to achieve their personal best they are ensuring that the ensemble is functioning at the highest level possible. So… the Margolis Method recognizes that understanding a concept and knowing how to manifest it are not conflicting approaches but rather 2 points on the same trajectory - the manifestation being a much longer process. Perhaps especially in an post secondary educational institutional setting intellectual cognizance is sometimes mistaken for embodied knowing. While the first does not in any way imply the second they are connected. Kari’s approach respects and integrates intellectual, creative and emotional intelligence and by addressing all three in her work she triples it’s impact. It’s a win win situation - something that sadly in this industry, is not always the case or even the goal. While as theatre movement teachers we may instruct from a variety of methods, we ultimately want to help our students become more free to have variety and clarity in their theatrical choices. For those of us who teach in academia though, our system is set up and therefore encourages students to compartmentalize their learning. Often what is learned in acting class, for example, is separated from techniques learned in Play Analysis, Voice, or Movement classes. While I'm sure that we all speak of the eventual necessity of integrating these studies, often we leave that blending to happen magically in production work or in an upper level "capstone" course. Is it possible instead to begin teaching theatre with out these divisions? I took advantage of the offer made to ATME members from Kari Margolisto receive a free DVD that featured clips from her teaching, philosophy and performance work. Intrigued, I was able then to take class for three weeks this summer with her in Barryville, NY. I came away with some specific exercises, of course, but more importantlywith a way of teaching that is very exciting to me. Her methods integrate everything about creating a theatrical moment immediately. I was training as an actor, one who is capable of thinking feeling and moving in an integrated way, right from the beginning. What I found was that my goal with her was not so much to learn a codified way of moving, but rather how to use a way of moving specifically to practice the larger issues of making theatre. The daily challenges for research would change, but the overall goal of creating something strong and vital emotionally, physically and thoughtfully was always essential. To give an example, using "the international language of physics" Kari would begin by leading a simple movement score such as breathing down into the core through the top of the head ("whale spout") while the arms respond to that impulse by moving upwards. Then we would reverse the movement to breath up into the core through the tailbone while the arms respond by moving down. We would also transfer the motor to the arms pressing up/down causing the response to be an in-take of breath in the core. We then would improvise with those movements, but are instructed to say what we are doing out loud. Voice is therefore immediately connected to the movements as well as a conscious awareness of what movements are being done or attempted. If you begin to go into a monotone drone, you can hear that disconnect and change it because the exercise is to match the energy of the voice to the dynamic of the movements. Eventually then to change to any text is a matter simply of changing words, not of adding the mechanism and intent of speaking. It becomes difficult to waft through space just "feeling" it, because the mind is connecting to what is happening both by impulse instinct and by choice. The physics of the movement must influence the shape of the vocalization. We are then challenged to devise a "packet" of sequential moves. The packet, like a beat, asks that the movements connect, transform fromone another, and develop through a beginning, middle and end. Once the movement cycle begins, active resistance is used to keep the character from coming to stasis. In something as simple as putting five moves together, you are drawing on techniques of play analysis, shape, dynamics, objective, conflict, and of course physics. Then as you move in space, you also consider more elements ofdramaturgy, as for example, what do your three steps mean vs. your onestep? Where are you moving in reference to the space available and to the perspective of the audience? How do you take what you are doing and work with another person, inspiring the other through your voluntary actions and your vulnerable responses to what the other is giving you? What is the pattern/story that is developing and how can you work with it and your partner to find its conclusion or its development into the next moment? What I especially like is her attitude towards vulnerability, speaking about it as a simple honest result of physics, rather than as an opening of your entire being and soul to the world to be ripped asunder as most of my students seem to think I'm asking them to do when I mention "being vulnerable". Margolis works with how you voluntarily set a movement in action, which then results in an involuntary response. As the actor you need to be able to instigate that initial cause, but then you also, to be truthful, have to be open to where that movement may take you or to be available to what it causes to happen in the other person. Sometimes your action goes just where you planned and other times you are surprised at the outcome.This process is of course, the same as a character's journey through a play. You, as actor and character, need to be able to receive the result of your action muscularly, psychologically and emotionally. You are asked to keep the history of the effect as the basis from which to transform into your next voluntary move. By keeping vulnerability as a result that continues to transform, it seems to position that notion as something more dynamic and useful and less emotionally terrifying and static. Time to flail around is important time in class, and since Margolis terms all of this work as "research" I was encouraged to use that time to look both at what I was developing as well as how I was finding it,what was missing, and what was yet to be done. Questions of "what" "why" "where" "how" and "what next" were continuously guiding me through my solo investigations, my constructions of packets as well as my improvisations with others. `Yes, you are trying to do, think, feel 2,573 things at once, and yes, it's hard and frustrating. But isn't multi-tasking what we are doing when we are acting? It takes practice to connect since we have all been taught so well to separate and to compartmentalize. It takes practice to find an honest psychophysical ease of acting in the moment, i.e., eventually to just do it. Even though I was there only three short weeks, I feel that I came away with a method that gives me a way to study further because Kari Margolis has created a method that integrates learning about how theatre works; I am deliberately practicing using the parts to create a theatrical moment ofspecificity and depth. Yes, her method is about eating the whole elephant right away. While many other techniques and most academic programs start by munching an ear and then progressing to nibble at the right leg, I think with Margolis' work I can start with gulping a whole elephant the size of an ant. If I can do that, I get the whole elephant and have a good idea of what the elephant is. With practice I can then progress to bigger sizes, but I'm still working on the whole. Click here for full letters of recommendation.